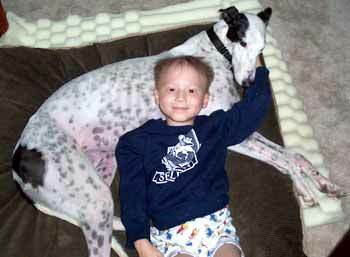 Back in March, 2002, GALT received an adoption application from a couple, Tom and Tricia Thomas, and their five-year-old son, Ian. They lived near Gainesville, and were in the process of finishing their fence. It was agreed that they would wait to choose a greyhound until their fence was completed and their yard was secured. GALT checked with them periodically about the fence progress. Then one terrible day, an e-mail arrived from Tom that said they would have to put the adoption on hold because their son had been diagnosed with leukemia. 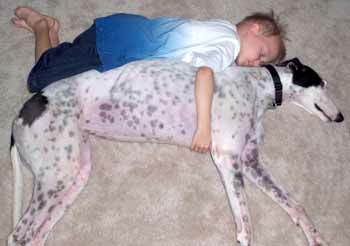 Tom was confident that a greyhound would be in their future but just not at that time. They knew they had a rough road ahead of them. GALT, of course, would wait and hope for the best for them. GALT occasionally inquired about Ian's progress. GALT was at Bass Pro Shops on September 28, 2002, and who should walk in but Tom, Tricia and Ian. 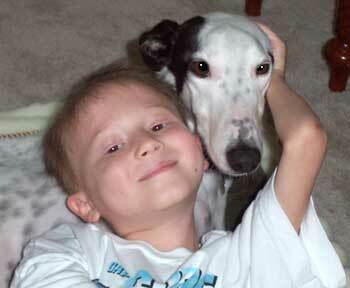 Ian's treatment was progressing, the family had moved to Denton, and they were ready for a greyhound. That day, a black and white female named Tracy, who was being fostered by Wesley and Shelley Caskey, was there along with several other dogs. 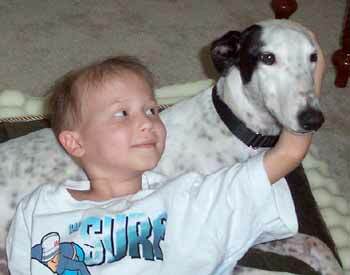 Ian fell in love with Tracy and decided that was the dog he wanted. Unfortunately, GALT had already received an approved application from a couple who wanted Tracy. Of course, Tom, Tricia and Ian were disappointed but agreed to look at other dogs. Tom said that if anything happened to the adoption of Tracy to let him know. They began making plans the next week to look at other dogs at Houn' House on Saturday. The following Friday, October 4, 2002, Shelley and Wesley were going to take Tracy to her new owner's house because they were leaving town for the weekend. Early in the day, Suzanne Griggs received a call from the potential adopter who said, after looking at crates, he and his wife were afraid the dog was larger than they thought and wanted to look at some other breeds of dogs. Suzanne told them GALT would be glad to hold their application but that GALT would not hold Tracy. She immediately called Tom and Trisha and told them the news. She told them if they still wanted to adopt Tracy she was available to them. Not only did they want her, but they wanted her that day! Ian had just come home that day from being in the hospital that week, and it was just what everyone needed to cheer them up. Wesley and Shelley quickly changed gears and delivered Tracy to her forever home that Friday night. The other greyhounds they were going to look at have all found forever homes, too, so it was a winning situation all the way around. The following is an email from Tom sharing their experiences with Ian and Tracy, together with priceless photographs of the two best buddies. This is later than I intended to email you, but everything went from really busy to really busier since we got Tracy. We're adjusting to one another quickly and Tracy is starting to get braver in what she tries to get away with, so I think that's a good sign! Ian just loves her, falls asleep with her, feeds her (at least part of the time). I believe it's made a difference in how he looks at things. The first week she seemed lethargic, so we took her to one of my best friends who is also a vet. They did some blood tests, the usual stuff, and finally Ian got to be the one taking a patient to the doctor and making sure everything was OK which she is just fine. This next part may surprise you - it did me! We were giving Tracy some pills for diarrhea and Ian started helping, rubbing her throat, and making sure we gave them when it was time and helping with the whole process. He has been struggling with pills since he started treatment and there are always some to take. We've had to crush them up, and he often can't keep them down, then we have to start over. It has been the toughest struggle of these last 5 months. Well, he thought it was pretty cool the way we gave them to Tracy and he said, "Dad, wouldn't it be funny if you gave me my pills the way you give them to Tracy?" We laughed about that. He had finally managed to swallow his littlest pill whole a couple of times. A few days later, when it was time for his medicine, it was a big pill and a little one. He said, "Dad, let's pretend I'm a greyhound and you give me the pills like we do Tracy." I'm ready to stand on my head by this point, if it will help him get the pills down whole. Not holding out much hope for success, I agree. He gets down on all fours, I put a little butter on the biggest pill, hold his head back, pretend to pry open his mouth, and place the pill way in the back. Then I shut his mouth, lightly hold it shut, and stroke his neck, top to bottom. After a few seconds I feel a little gulp, and he beams ear to ear. "Dad! It went down!" It is honestly one of the biggest reliefs of my life. He'll be able to take anti-nausea pills without throwing up (which defeats their own purpose, after all), swallow instead of crush and taste the pills that are absolutely horrible in taste...you can imagine the problems it solves. Anyway, I know this particular benefit won't apply to the majority of potential adopters, but it sure was an unexpected bonus for us! But I firmly believe it was having Tracy, and Ian helping her and seeing her at the vet, getting blood tests, and generally getting outside the role of patient for a while - I do think Tracy had a part in Ian deciding to give swallowing the pills a try. Beyond all the specific pleasures, watching him hug her, fall asleep with her, feed her, go to the doctor with her, Tracy is just a positive change in the dynamics of our home. It's hard to explain, but there is an additional focal point for us that is a welcome relief from the intensity of Ian's treatments. And I think Ian is relieved finally not to be the only target of our concern. He gets a little break from us. And it's so great to just sit around and pet her. What a great dog. Once again, thanks for doing the great job y'all did, of bringing Tracy and us together. In response to this story - Things REALLY are meant to be! I just read the article about Ian and Tracy. My husband and I are the couple who originally wanted to adopt Tracy. I really wanted Tracy and bought her toys and was anticipating her arrival. Friday, the day we were to get her I went to a pet store to get her food and look at crates for her. While I was there all of a sudden a STRONG feeling came over me that I should not adopt Tracy. I could not figure it out -- the feeling just overpowered me. I looked at my friend and said I can't do this. I really want Tracy but something was holding me back. I looked at the large size of the crates (although that should not have hindered my decision), and I just had a feeling that Tracy did not belong to me. All these months I have thought about this and why I felt so strongly. I was so thrilled to see you with her and how happy she makes you. I wish that I would have known at the time that you were out there and wanted her. I am so happy that she is yours. You are such a beautiful little boy. I printed out the article and plan to show it to all my friends and family. I have e-mailed the GALT link to friends and family to read this article. I have never been so touched by anything like this. And this story just keeps getting better! Pearl has been adopted by Mr. and Mrs. V and is in her forever home!